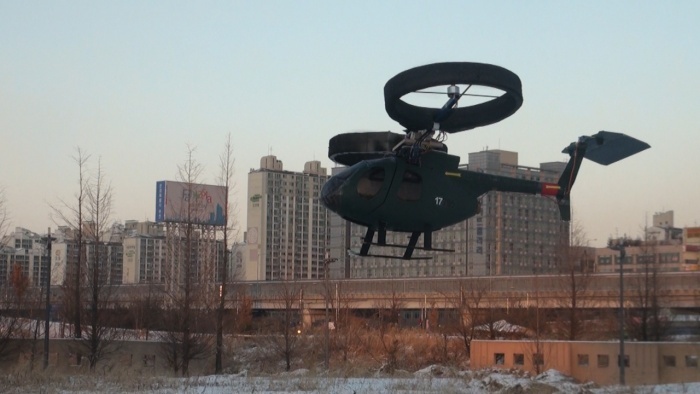 The commonly known helicopter has one motor, while a multicopter is a unique kind of aircraft that is equipped with two or more motors. Multicopters often use fixed-pitch propellers, so the control of vehicle motion is achieved by varying the relative speed of each motor. 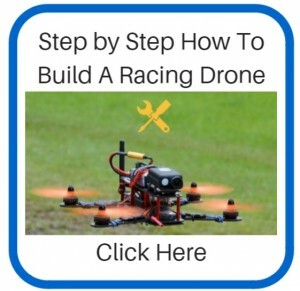 Radio controlled multicopters are increasingly popular to be used as a low-budget option for aerial photography and videos of landscape and buildings, even racing and acrobatic sport flying. In this article we will explore the various types of multicopter configurations and analyse the pros and cons of each. There are many types of multicopter configurations. They are generally classified and named after how many motors they have, for example a three-motored multicopter is called a tricopter, and as known as the Y3. The number of motors and configuration of each type of multicopters bring some up and down sides to their performance. For instance the more motors the more power (more lift capacity) and you can carry more batteries (bigger battery) to gain more flight time. But the downside is more expensive for the additional powerful motors, ESCs and battery packs. The BiCopter has two motors that can be moved by servos. It is similar to the “Avatar Gunship” (if you have seen the moive). It is considered as the cheapest multicopter because it uses only two motors and two servos, but it’s the least stable platform and is hard to tune. It’s also the least robust and has less lifting power (given the fact that it’s got only 2 motors). This is the least popular configuration for hobbyists, so there isn’t much information to be found. 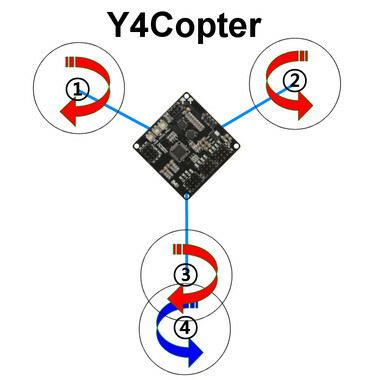 The Tricopter has 3 motors in a “Y” shape usually 120 degrees apart, or sometimes “T” shape. Two propellers on the front arms pointing to the sides or slightly forwards, and one arm backwards. The rear motor can be tilted laterally via a servo to enable the yaw mechanism. It’s a relatively cheap configuration because it only requires 3 motors (although you also need an additional servo but they are generally cheaper than brushless motors). It’s generally less stable than multicopters with more motors and it’s not as robust – especially the tail servo and mechanics – in crashes. It’s also harder to build because of the yaw mechanism. It also has lower lifting power because of the smaller number of motors. A typical quadcopter has 4 motors mounted on 4 arms of a frame that is symmetric, each arm is 90 degrees apart (for X4 config). There are two sets of CW and CCW propellers mounted on the motors to create opposite force to stay in balance. 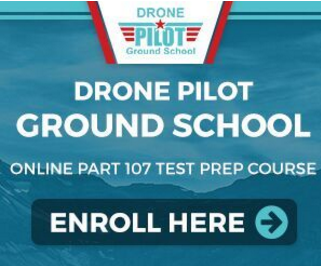 The quadcopter configuration is the most popular type and mechanically the simplest and easiest to understand. There are 2 configurations: ‘X’ or ‘+’. For photography X config is more popular as you can keep the propellers out of the screen. For Sport flying, some people fly the plus (+) config because it’s more like an airplane and easier to figure out the orientation and fly around. 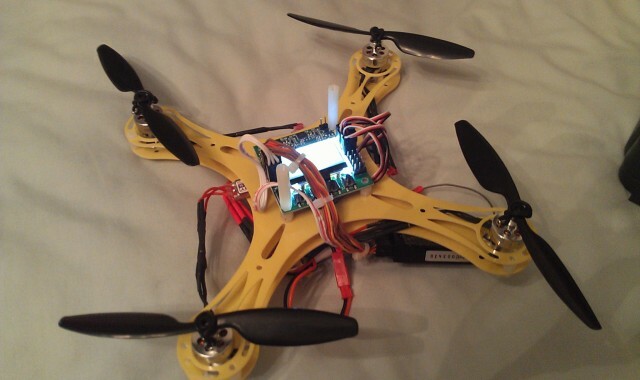 Check out the micro quadcopter I built a while back. Recently, the “H” configuration has become really popular for aerial photography and first person view (FPV). It allows a camera to be placed on the frame well forward to avoid having propellers in the view of the camera. It looks like a tricopter but without the tail servo. There are two normal propellers and motors in front on separate arms and two coaxial motors in the rear mounted to one arm. Mechanically, it’s simpler than tricopters because of the absence of the servo. While they weigh almost the same, they have about 1/3 more lifting power compared to tricopters. They are usually more reliable than Tricopters because there are no potential servo issues. The Vtail is a quadcopter config with the front motors on normal quadcopter arms, while the rear motors located in close proximity, tilted at a vertical angle. It’s a mix between a quadcopter and a tricopter and very similar to the Y4 config. This is not a popular configuration because it should give lower power efficiency and flight times (at the tail motors, air blow interference). However I think it provides a better orientation visibility. There isn’t much information on this config because it’s not a popular setup, due to possible underlying issues. But there have been people building these and verifying the feasibility of this cool looking config. One obvious advantage of the pentacopter is the wide angle of the two front arms which allows the propellers to stay out of the camera as far as possible. 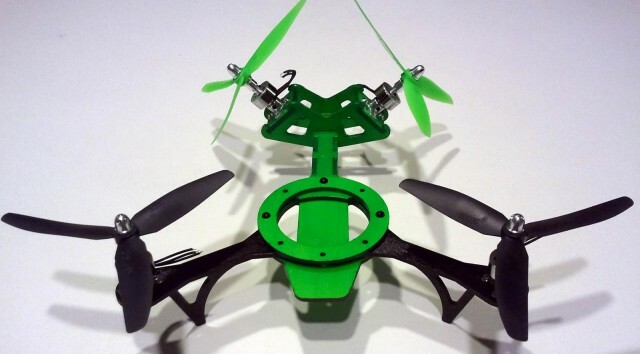 Check out this post about an example pentacopter project. 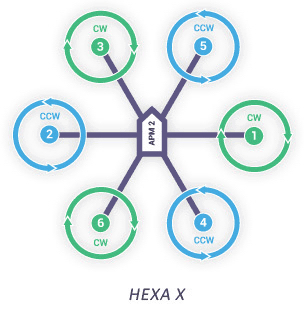 The hexacopter has 6 motors mounted on 6 arms 120 degrees apart on a symmetric frame, with three sets of CW and CCW propellers. It’s very similar to the quadcopter, but it provides more lifting capacity with the larger number of motors. It’s also possible that if one motor fails, the aircraft can still land safely. The downside is that they tend to be larger in size and more expensive. The Y6 has 6 motors in a “Y” shape frame. 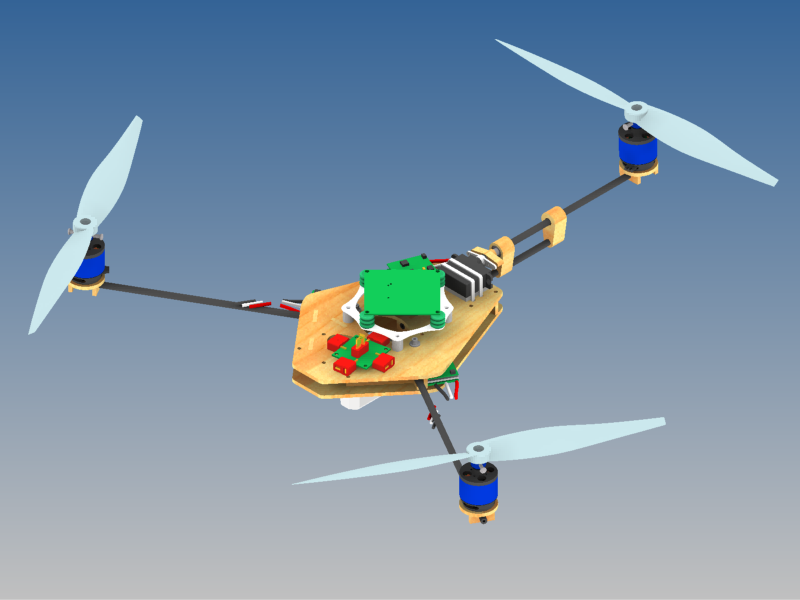 Similar in shape to a tricopter but it has two motors per arm, one above and one below (6 motors in total). It uses both CW and CCW propellers on the same arm, rather than a servo to enable yaw. This type of multicopter can be made more compact (as big as a tricopter) for the similar lifting capability as the hexacopter. However it is less efficient due to the coaxial motor-arrangement. 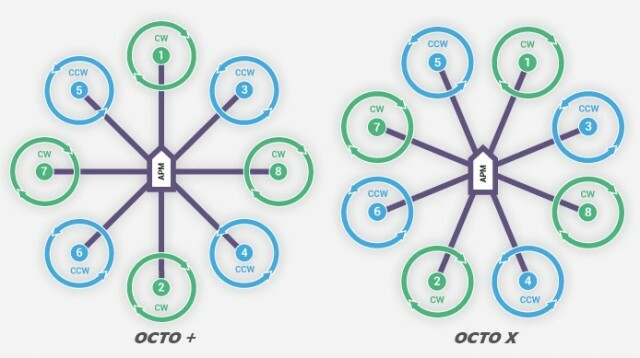 A typical octocopter has 8 motors on the same level with four sets of CW and CCW propellers. Again, this similar to quadcopters and hexacopters. It’s an upgraded version of the hexacopter with even more lifting capacity. It’s also reliable because if one or two of the motors or ESCs fail, it should still be supported by other working motors and able to land safely. But it will draw more current from the 8 motors, and you will probably need to carry a couple of battery packs. Also it’s going to be quite expensive. 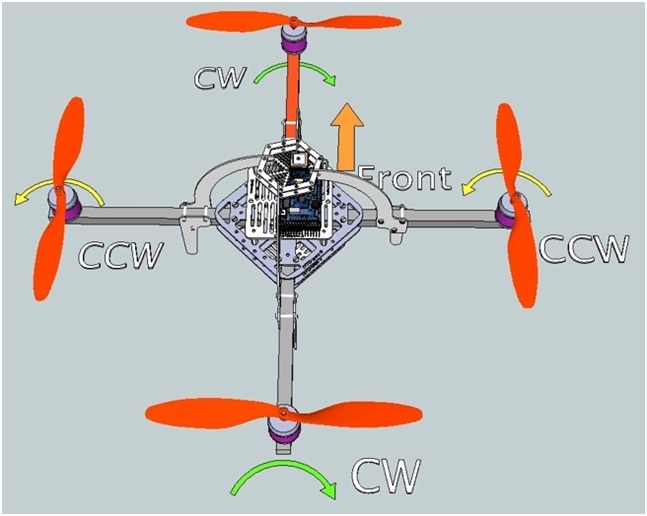 An octocopter uses 8 motors that are mounted on four arms, on an “X” shaped frame with four sets of CW and CCW props. Characteristics are similar to the Y6. 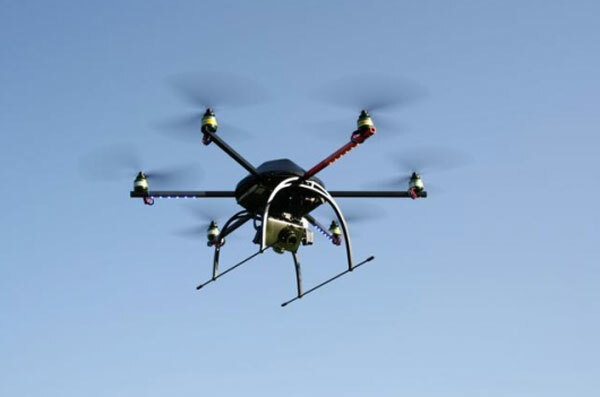 How to choose the right multicopter configuration? Weight is the key. The first thing you have to do is decide what you are going to do with your config. Just for fun, a quadcopter or tricopter would be great. 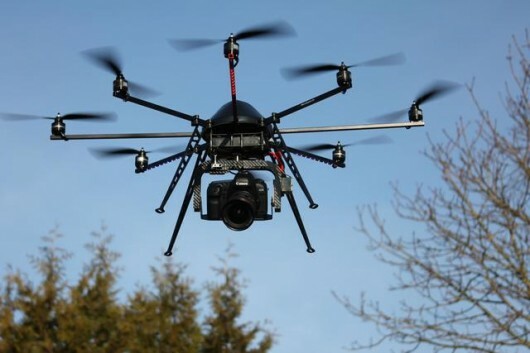 But for more stable aerial photography, you might want to consider a Hexacopter or Octocopter. Secondly, how much the payload weight you need to carry and then build a platform to pick it up safely. For example if a quadcopter needs to lift a payload, it might consume more power to do it than a hexacopter that is using more but smaller motors to an extent. The Y configuration allows the booms to not appear in the camera viewing angle. 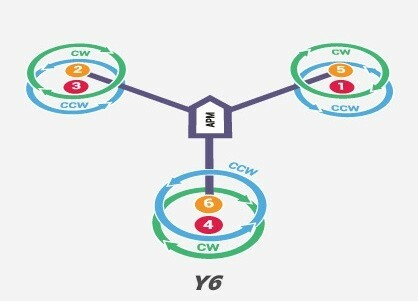 In Y6, X8, Y4 multicopter configurations, we encounter something called coaxial motor-arrangement. There are some pros and cons to them. bottom propellers can get caught easily as pilots can’t oversee them so simply. possible 10-20% loss in power/efficiency, because basically the bottom motor is just turning in already sped-up air. You can try to weaken this issue by using longer/higher pitch propellers or a higher rpm motor. difficult to find an appropriate landing gear because it can’t be mounted that far out on the arm. 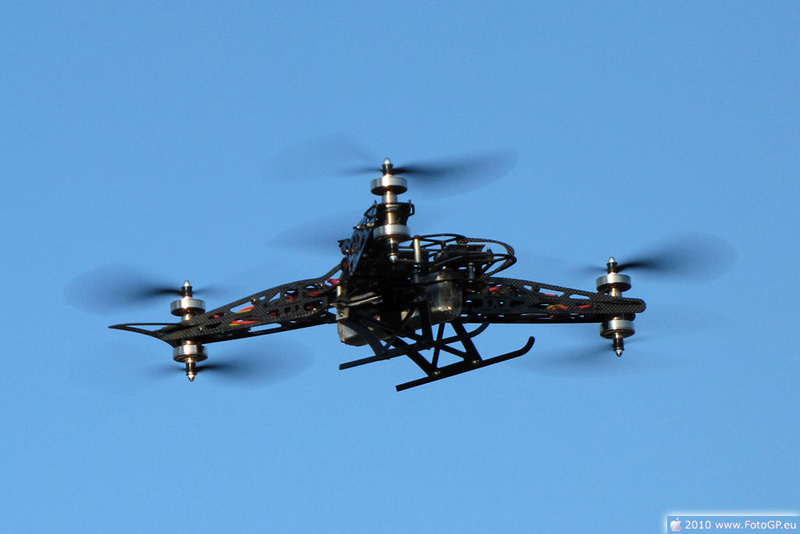 The above is a basic introduction of some most popular multicopter types. Depending on the usage of the multicopter you want to build, carefully choose the right type, or simply test most if not all of them. 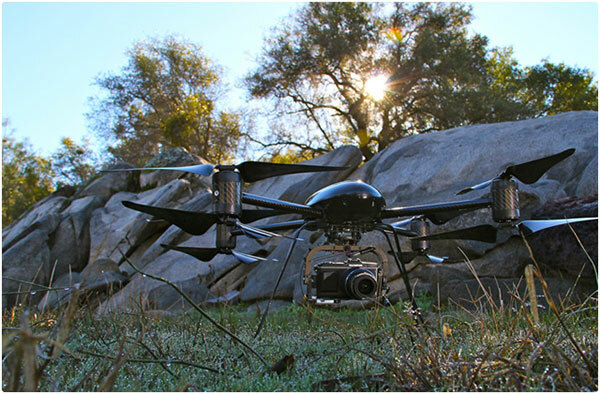 Generally for Aerial photography, the Octocopter is generally more stable out of these multicopter configurations. If you want a smaller one, take a Y6 or X8. They still can be proper heavy lifters and fold down nice and small so they make a much easier travel-companion. 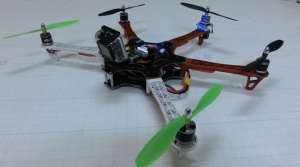 If you just want a simple, cheap multicopter, a quadcopter or a tricopter might be a good idea. As the capabilities of the multicopters have been advancing quickly, more and more practical uses for the technology will become possible, and we might also get more creative and effective multicopter configurations in the future. An earlier version of this article originally appeared on Oscar Liang’s blog. In this article we explore the various types of multicopter configurations and analyse the pros and cons of each with help of Oscar Liang. 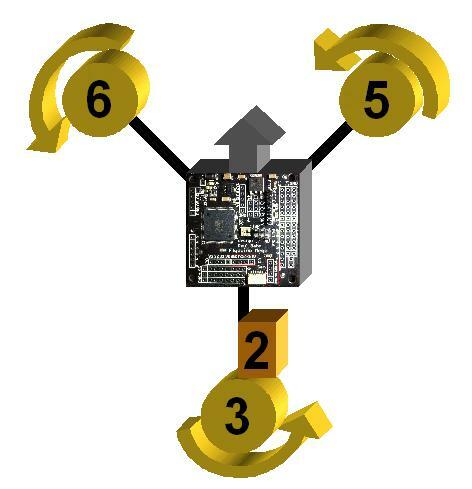 Another major consideration which many are looking for and can’t easily find out,, namely, Which configuration and which control board in 2015, will give the easiest safest multirotor to fly. Crashes are really expensive when they take out most of the machine in a bad crash. So, the chip/gps/radio/configuration that is completely easy to fly. First one I bought had no no choice in the board to give inherent stability, crashed it 20 times learning to fly it. So, when judging configurations, the computer/gps and radio would and should be apriority for newbies when picking out a total system. Help us out on what will make this thing less likely to end up in the neigbors living room. 🙂 Thanks for the info. “possible 10-20% loss in power/efficiency, because basically the bottom motor is just turning in already sped-up air” ??? Possible 10-20% gain in power/efficiency, because basically the bottom motor is turning AGAINST the sped-up air. Thank you AK, good to know! You mention the advantage of keeping propellers out of camera shot with a wider angle on the front arms of a pentacopter, but you only mention X and + configurations of a quad. Seems like it might be worth mentioning the dead cat configuration for quads as well, as it has the same wide angled arm advantage.